Harold Pinter’s Betrayal has been revived on Broadway, the West End, or wherever else many times since its debut in 1978. Not because it’s a great play, but because actors love the challenge of it. Betrayal is an interesting character piece, a study of intertwined relationships, with a gimmick — a conceit, if you prefer — in which the playwright plays with our perception of time as he manipulates his characters back in time. Its three characters live backward before us, so that we see (and the actors play) the end at the beginning all the way through, reverse chronologically, to the beginning at the end of 75 or so minutes. Mike Nichols is a highly skilled director and the production presently playing to full houses at the Barrymore is polished from curtain rise on 1977 back to 1968, with sets by Ian Macneil sliding in and up and out and down, portraying places where these three characters live and love and hate. 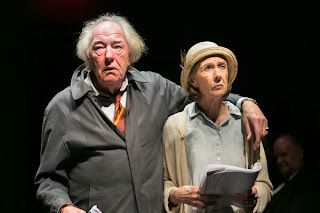 Pinter tells us in the very first scene everything that’s happened and that therefore we are going to see, but that doesn’t keep us from watching all the way through. It’s about how, not what. Each time something is revealed, we yearn to see what happened before that, and before that, and before….instead of next, next, next. It’s a fascinating conceit and it does work. While Rafe Spall may not yet be a star in the U.S., he will be. His besotted Jerry is a delight, Jerry who is nothing special, whom one would pass by on the street, but who inspires love in the other characters. Mr. Spall’s lanky form curls and slopes and leans into and away from his fellows. It’s impossible not to watch him onstage, even when Daniel Craig is beside him. It is Jerry who is in most of the scenes, and even if he’s not present, the other characters are thinking about him, so we are as well. 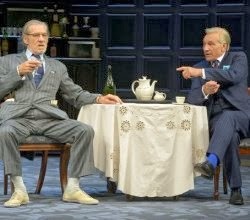 The second scene of the play, between Jerry and Robert (Daniel Craig), is beautifully staged, with the long estranged friends starting on opposite sides of the room, crossing past each other’s territory, until the truth allows them to become comfortable with one another again, sitting together. Gorgeous. This immediately sets us up, as well, to not particularly like the woman who came between them, Emma. Despite the fact that Robert admits to having “bashed” her once or twice, Emma (Rachel Weisz) seems always in control of the relationship between herself and Jerry. Her only vulnerability shows when Jerry leaves for America and she breaks down in front of her husband, whom we’ve just learned knows about his wife and his best friend. Robert likes to play squash with his male friends and go to the pub afterward, an afternoon and/or evening of all male companionship. No women. We can tell he’s a terror on the court and he has noticed that the men he knows or suspects are sleeping with his wife will no longer play squash with him. He may not be Menelaus, but the savage sometimes rears its head beside that of this cerebral man. Of the three characters, Jerry is most breakable, most childlike. Robert has built up a hard shell, humorous when he oughtn’t be, seeming callous. Daniel Craig makes it clear there’s much more going on than that. I was surprised to find Rachel Weisz, whom I quite like on film, to be the weakest link on stage. Pinter pauses are one thing, but her side of the stage sometimes appeared, sounded, rather empty. Stephen deRosa’s delightful turn as the waiter in the Italian restaurant is as polished as the three primary roles. Pinter and the company stimulate our laughter at the vagaries and vanities of human nature. An intellectual play, Betrayal is not quite great, but it’s more than clever. It’s not easy to connect with these characters however similar their stories may be to some of ours. Despite the tight and smart direction, despite the performances, nothing about this production engaged me. The people did not engage me. So for all its clever mind games, my heart was untouched. 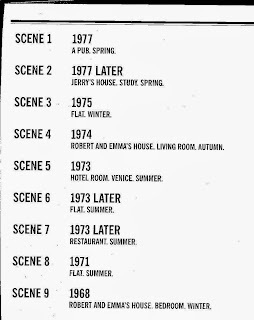 The second Pinter play was one I’d never seen before and which, although in chronological time, was by far the more confusing of the two. 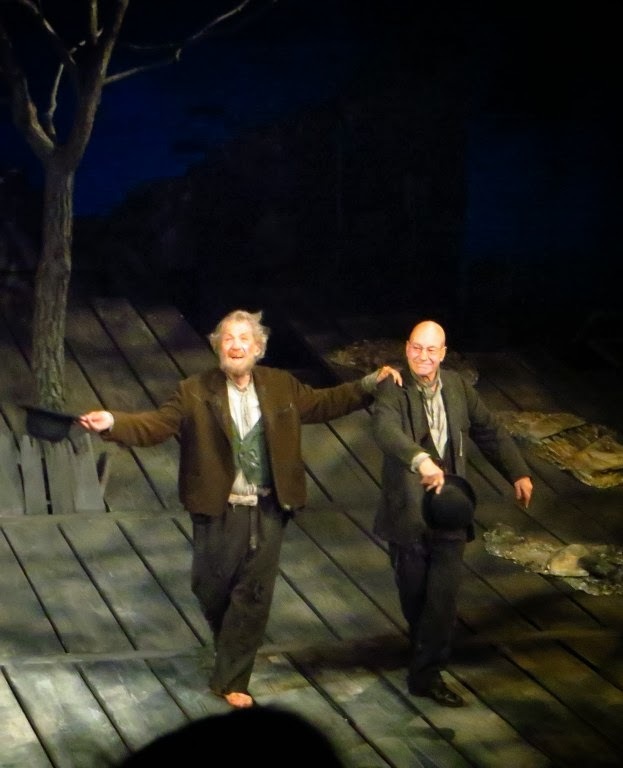 No Man’s Land is part of a double bill with Waiting for Godot — which I look forward to seeing in a couple weeks — with a highly anticipated cast: Patrick Stewart and Ian McKellen supported more than ably by Billy Crudup and Shuler Hensley. No Man’s Land, unlike Betrayal, is played in chronological time. 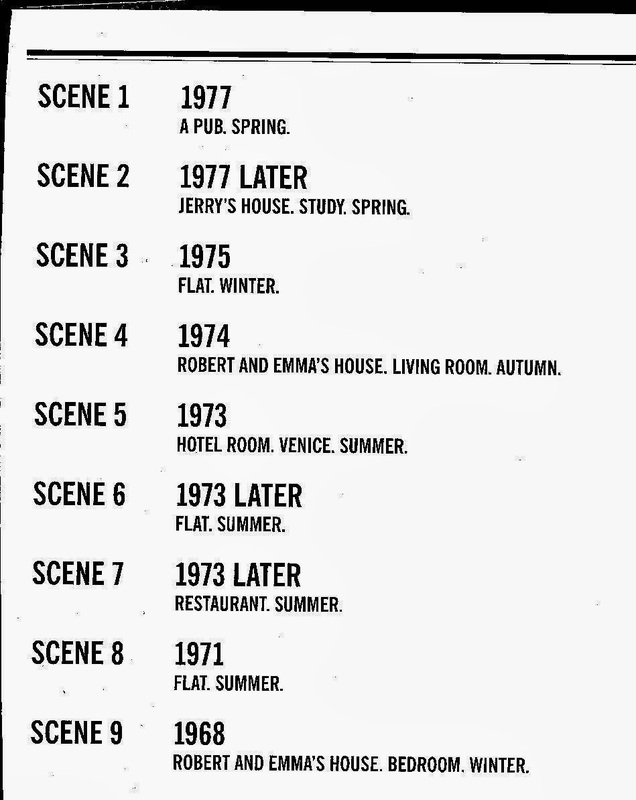 Note I did not say “real time,” because this earlier effort of Harold Pinter is wilder, more Beckettian. Two men are onstage, and we know nothing about them except that one rarely speaks and the other rarely stops talking. In the grandiloquent role of Spooner, Ian McKellen shines, glows, and takes flight. As the quieter (for the first act) Patrick Stewart is fascinating in his stillness and sudden spurts of drunken energy. Mr. Stewart’s character Hirst is falling down drunk but that does not deter him from heading for the drinks cabinet. The babblefest continues until the entrance of Billy Crudup as Foster, the glibly dangerous younger man, self-appointed caretaker to Mr. Hirst along with Shuler Hensley. This is typical Pinter, a couple of guys menacing by their very presence. Foster holds in his violence with enormous effort, which does not lessen his ability to bully. Shuler Hensley’s Briggs, the more obvious bully, barely speaks while holding himself at the ready. Mr. Hensley is terribly still, emanating menace. The second act gets even more confusing with Hirst, now sober yet less than clear-headed, reminiscing with Spooner while addressing him by another name. We start to wonder if these two men who’d appeared to be strangers the night before are now old … rivals? Surely not friends. None of the confusion is down to the direction by Sean Mathias, which was crisp and clear, rhythmically moving from quickly paced to leisurely. It’s Pinter having fun with his audience again. Ian McKellen and Patrick Stewart in No Man's Land. The scenic and costume design by Stephen Brimson Lewis were perfect, lighting (Peter Kaczorowski), music and sound (Rob Milburn and Michael Bodeen) all contributed to the feelings of claustrophobia, menace, with a bit of “no way out” tossed in No Man’s Land is beautifully put together. We may not understand what happened in the second act any more than in the first, but with Pinter, we can always just raise our eyebrows and say, Oh, well, it’s Pinter. ~ Molly Matera, signing off as the fall season really kicks into gear. So many plays, so little time…. "Girls! Girls! Girls!" That’s what “theatrical” venues used to say about their female stars. Phyllida Lloyd’s scintillating production of Julius Caesar is not titillating in the usual sense, and one would be foolish to call any of these women “girls.” From London’s Donmar Warehouse to Brooklyn’s St. Ann’s Warehouse, this Julius Caesar is the opposite of traditional, since traditionally Shakespeare’s plays were performed by all male casts. This production turns the tables. The conceit for this is the setting of the play in a women’s prison. Fair warning: It’s not your standard entrance to the theatre space either. The crowd gathers in the aromatic coffee shop next door to pick up tickets, then masses in front of a loading dock’s corrugated metal door waiting to enter. We wait a long time. When we finally get in there, the audience is treated like visitors to a women’s prison, with lots of rules — though no pat-downs. It’s past eight (which the officious email that had gone out to ticketholders said was curtain time — no latecomers allowed in!) when that big metal door rolls shut a second time, and a different door opens. Gray-clad women enter, and the action begins. We are rapt, captive not just because the scary corrugated doors are noisily closed and guarded. Physically, emotionally, intellectually, we are captivated. Perhaps a little nervous. The female prisoners are broken, shuffling creatures, weighed down by the incarceration and the hierarchy of the prison population. They are mean to one another, small cruelties at first, ready to explode any moment. 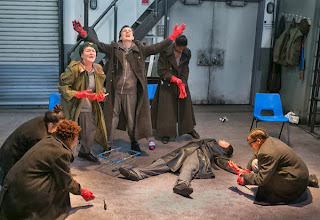 The women show new life as they take on the characters of the play, changing no words to fit their gender (although, running a little over two hours, this script has been heavily and well edited). It’s still Rome, they’re still “men.” Besides cutting scenes in their entirety, the 35 named characters of the play are whittled down to 20 as played by the company of 14 women. The opening scene features women holding masks before their faces — the masks all the same photograph of Frances Barber as Julius Caesar. The opening scene of the original script is accomplished very quickly without any of the text, just behavior and those creepy masks. There are occasional insertions reminding us where we are. Like those gray sweats, although the attempt to make all the women alike and equally downtrodden does not entirely succeed. They are individuals, some willingly submissive, some frightened to be otherwise. Each one comes to vibrant and sometimes violent life as citizens and senators of Rome. The time is now, and the music is rock, driven by a bass guitar and drum set. Harsh, loud, percussive. 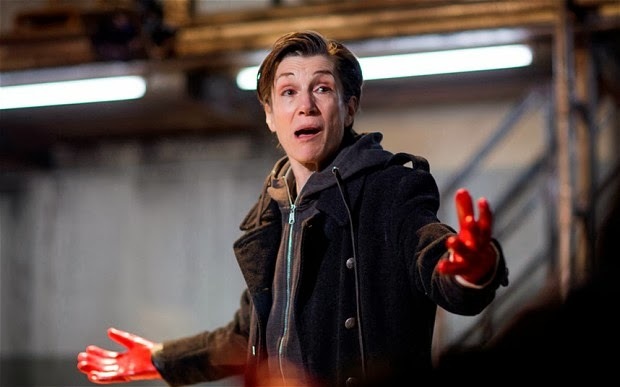 Harriet Walter’s brittle Brutus is stuck in her head — his head? — overthinks, tries to be upright, and spells doom to his cause and comrades. Frances Barber’s Julius Caesar is a bully (which makes even more sense at the play’s end, which I won’t spoil), easily scarier than any man I’ve seen in the role. Jenny Jules’ Cassius is lean and hungry, spoiling for a fight. Cush Jumbo is a smooth and moving Mark Antony, and Susan Brown a cunning and repressed Casca. Scenes are pared down to the bone, sharp, concise. Things are not all orderly, there are shouts, a bloodied nose, a substitution of one prisoner for another to move the play forward to its inevitable end. At one point a guard yells out “Meds!” offering a flash of One Flew Over the Cuckoo’s Nest. I’ve seen quite a few productions of this play and directed a staged reading of it once, also with an all woman cast. I heard then how different all those famous speeches sound in a woman’s voice, from a female state of mind, a woman’s heart. At St. Ann’s Warehouse, the language is as fresh and new as the interpretations. This Julius Caesar is totally different while equally tragic. It is harsh and no one wins. This is a limited run, only to November 3, yet it’s not sold out — I highly recommend you run to catch this excellent, rather thrilling production. ~ Molly Matera, signing off to re-read the play, hoping to hear those marvelous words and phrases in my head. The thing about Big Fish is that it looks fabulous. Director/Choreographer Susan Stroman knows how to set ′em up then pull out all the stops with energetic and/or synchronized dance numbers. She overwhelms us. Combining fantastical scenic design by Julian Crouch and imaginative Projection Design by Benjamin Pearcy, glittering lighting design by Donald Holder and the always fresh costume design by the ubiquitous William Ivey Long (he designed Norbert Leo Butz’s trousers to cling just enough to showcase his lovely bum, thank you very much), these fine theatrical pros have created a visual feast of a thousand delights. If only the music could keep pace with it. In this carnival like atmosphere we are surrounded by Edward Bloom’s wondrous view of the world. Composer & lyricist Andrew Lippa’s contribution is outclassed by the rest. Yes, it gives Butz and the sweet clear voice of Kate Baldwin a little fun, a little sorrow, and allowed Bobby Steggert to pierce the upper register. But Mr. Lippa has not given us any tunes to stay with us as far as 52nd Street, however pretty or character-appropriate they seemed when sung by the excellent company. 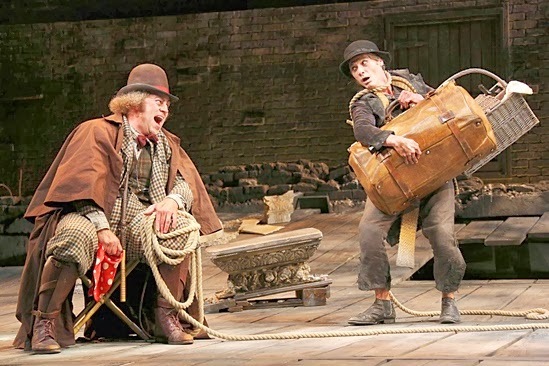 Since this is a musical, one must pause — is all that razzmatazz, rather like special effects in a film that lost its plot along the way, there to make us ignore our disappointment with the unmemorable music, lyrics, and book? Kate Baldwin is strong and sweet as the redhead Edward Bloom loves at first sight, while Kirsten Scott is equally effective as Jenny Hill, the girl he left behind. Special marks go to the young Zachary Unger whom I saw as young Will and later as Will’s son. Bobby Steggert as Will is adept yet not inspiring; Krystal Joy Brown is charming as Will’s wife. Excellent the company surely is, exemplified by the fact that I saw an understudy in the role of Amos Calloway the circusmaster. Preston Truman Boyd, while he seemed a bit young for the role, stepped up with confidence, if not yet polish. I don’t believe in applauding a performer because he or she shows up on time, so I didn’t applaud when Norbert Leo Butz made his first appearance as Edward Bloom. Many did, however, yet it was a different sort of ovation: This was not people applauding because they saw a Star of stage or screen. It was a wave of love. Thus began a remarkable performance. Norbert Leo Butz is our Everyman on that stage. He makes suspension of disbelief in this magical musical easy. He speaks, then suddenly you realize, oh, he’s singing now. Effortless. Beautiful. There’s no transition. He speaks, he sings, he walks, he dances. He lives Edward Bloom on that stage and makes it all seem worthwhile. For a while. The question is, can this show survive without Mr. Butz? My presumption is… not for long. However luscious the production values are, I do not believe the book by John August (who also wrote the screen adaptation) or Mr. Lippa’s music can hold up without Mr. Butz’s astonishing and engaging emanation of love and hope. Mr. Butz’s Edward is a man with dreams, and if life is too ordinary, he’ll tell the tales so as to make it wondrous. Mr. August’s book has left me hungry, and for that I am grateful. While I saw the film and enjoyed it, I now wish to go further back in the life of Big Fish and read the original novel by Daniel Wallace. There’s stuff in there that did not make it into this musical version, and I yearn for it. The visual production of Big Fish will make you gasp and exclaim. It’s wild and crazy, a gorgeous world overflowing with fields of daffodils, populated with circus giants and witches and a mermaid. You won’t exit the theatre singing, but you will be happy. It’s at the Neil Simon Theatre. On 52nd Street. Where you will forget any music you heard as soon as you exit the theatre. You will not, however, forget Norbert Leo Butz. ~ Molly Matera, signing off in search of a bookstore. The drive to Amagansett, which should have been a smidge shorter than the drive to Montauk, took two and a half hours. OK, I stopped briefly at the grocery store, but the 2-lane highway was backed up for miles until I reached East Hampton, then it all broke up. As I got closer to the end of the Long Island Expressway, the storm clouds built up to the east. As long as I was driving east, I drove toward the storm. By the time I got out to Amagansett, though, the storm had passed, leaving several inches’ worth of puddles behind. Didn’t arrive at Driftwood on the Ocean (Montauk Highway, next to the Hither Hills State Park) until almost 4, unpacked a bit so I could get into the beautiful pool. It’s open 9-7 barring stormy (that is, lightning) weather. After swimming gently for half an hour (no exercise in far too long, so I started slow), I walked out to the beach. Rough surf, just beach as far as you could see east and west. I found myself a bit tired, but pushed on. On the way back from the beach, I stopped in the office to ask if any of the eating places were in walking distance. Three: Lobster Roll (a.k.a. “Lunch”), Cyril’s Fish House, and the Crab Shack. After showering me and rinsing the bathing suit (1 of 3), I hung the suit in the shower and headed out. It was dark twilight by then, and I walked down the road from the resort toward Montauk Highway. To my right was the pool, then some separate buildings, perhaps cottages (what an American would call a cottage, not a Brit), all shielded by the shrubbery and trees of the dunes. In the twilight I saw a deer. A buck, but not terribly big. He watched me, and I motioned him – all right, I told him, to go back into the park. Don’t go toward the road. I walked forward, watching him, and he walked parallel, watching me, bushes between us. Then I saw the doe. I gave her the same instructions, don’t go toward the road. Twilight and dawn are prime times for deer getting hit by cars. She seemed spooked and leapt into the brush. He kept watching me. He walked between the bushes and the cottage, watching me. I walked along, keeping an eye out for cars. One drove by me, but there were no awful sounds afterward. Cyril’s Fish House is just across Montauk Highway, so I stepped around the massive puddles from the afternoon’s storm and ran across the highway to eat. Bob Marley sang all the while. Children marveled at the mosaic fish scenes on the walls. Unfortunately, I couldn’t get to sleep. Pains, a bit of nausea – so glad I brought that can of ginger ale that came with a Chinese restaurant order. I had left the curtains slightly open, wanting the dawn to wake me. Well it did. I got up and looked to the east, and the red band lightening the sky was beautiful. Woke much later than planned. Put the “do not disturb” sign out. I need nothing. My arms vaguely achey, as is my neck, as if I slept badly. Which I did. The patio is raised one story, and concrete, with concrete molded fencing and wood fencing between the rooms. If I stand at the edge and look south east, I can see the ocean, just. For a while, in the wee small hours, I could hear the ocean as the traffic diminished. But mostly I hear traffic, the railroad’s horn, and the creatures in the preserve. In the night. Beautiful place, but I’d rather hear the ocean. After a walk on the shore did nothing to alleviate the stress brought on by some aggravating phone calls, I went to Montauk. I made my annual stop at the Montauk Bookstore, bought Shirley Jackson’s first published novel, and picked up a few more things (of course) at the IGA. The drive made me feel better. Ate at home. Love my back patio and the table. It’s all wrought iron, the seat cushions firm but soft, and I put one on the back as well. Spent much time there. I can’t seem to get myself down to the pool for “adult hour” between 9 and 10. Later morning, I swam for a bit. Annoying children who didn’t belong on the deep end. I remember loving to jump into the water, but that boy with the green goggles never let go of the ladder or the side wall, so he clearly was too afraid to be in the deep water, but his adult was on the shallow end of the pool. In mid afternoon I took a walk along shore, picked up some trash rather than see it washed out to say. Tide was coming in, and someone was going to lose primary-colored earth-moving machine toys. Sat for a while and stared from a lounge chair piled up near the entrance. Then at dinnertime swam in the pool. Decided not to walk the mile or so to Lobster Roll but drive, and went carefully at twilight (when the deer might be out again). Didn’t see them, did see a rabbit. Again woke multiple times in the night, had even closed the patio door in prep for a chilly forecast. Dreamt, I presume – someone walked along the walkway of front doors, shouting that we should find the button on the blanket and push it and it would get warmer. I found small pearl sized buttons along the edge of the blanket, pushed one, and it was warmer. Definitely a dream. Not a dream was my damn phone. It kept saying “Verizon Wireless.” Several seconds would pass, and then something about “leaving service area.” At least once an hour, as if the hotel were moving. The hotel didn’t move. At 3 in the morning I turned off the phone, and therefore my alarms. Dream-filled sleep. Friday, last full day. It’s chilly, delightfully. Bright sun on pool, kids there, I can’t go in just now but should go down there and just scribble what they say. Little girl with a harsh voice, the harridan cried, Emily, you said you’d jump, JUMP! Emily says she’s going to, harsh girl shouts VIDEO IT VIDEO IT to her mother, who foolishly says OK, but Emily won’t jump despite the harsh girl’s bullying. She does later. Woke a little after 8 from a dream in which all the cat food dishes were totally empty. It’s very cold this morning, so tough to take advantage of “Adult Hour” in the pool. The weekend brought rowdies, the kind who do 4 to a room. They were rowdy up to midnight last night and they’re rowdy now. Luckily there’s some barrier between their patio and mine, but still. Mostly packed, just want to take a plunge in the pool. As soon as I put on some clothes, I can start bringing things down. I can walk along the beach even after I’ve checked out, I know where the bathroom is, so I can relax. Note for next time – Although checkout time is 11 a.m., when I checked out at 10:55, she said I didn’t have to leave. That I could use the pool, go to the ocean, whatever, and just use the shower and bathrooms in the Recreation room, pretty much under my hotel room. So next time, I should plan on going home much later. Room 62 was lovely, but far from the water, so I heard the highway, not the ocean until the wee small hours when I should be asleep. Next time – a room numbered in low 50s would be closer to ocean, and still have private patio overlooking the ocean dunes. A less than relaxing time, but beautiful. ~ Molly Matera, back home, happy to see the cats, otherwise miss jumping in that pool every day…. I saw two movies in August, one for which I’d had a smidge of hope and one for which I had high hopes. 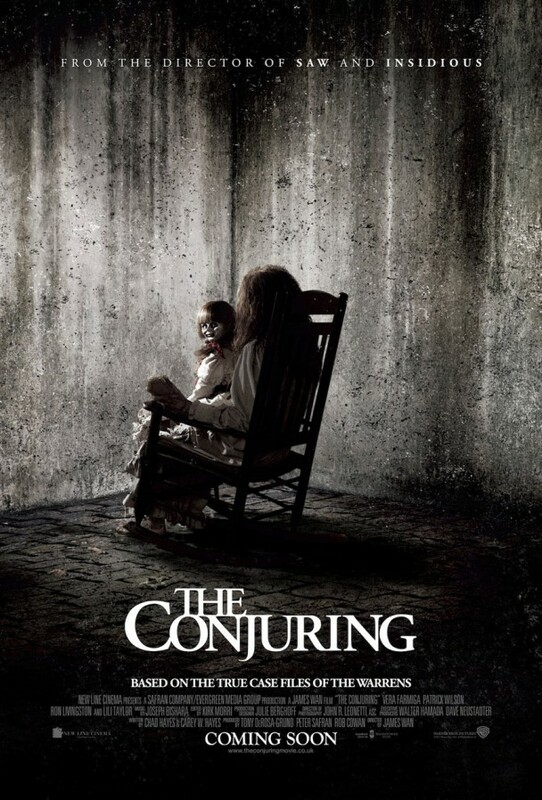 The one for which I’d had only a smidge of hope in the first place, The Conjuring, was quite disappointing. Director James Wan gave us a few startling jumps, but nothing really frightening. Lesson the First: When the family dog refuses to enter the big isolated house they bought at auction, the human family shouldn’t enter either. Alas, humans never learn. In The Conjuring, demonologists Ed and Lorraine Warren discover the real thing in a secluded farmhouse that the Perron family bought with the last of their savings. The clothes and hair are the first clue that we’re in the 1970s. The music seems occasionally out of time. The mentality is older — God and Demons are one thing, but the Warrens believe unhappy women were witches and could control the actions of the living centuries after their own deaths. 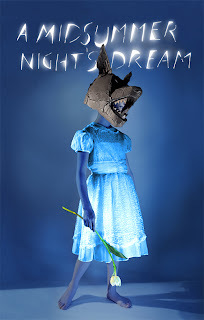 While there are plenty of frights and gasps and starts, this movie talks too much, shows too much, and tries to make believe it’s practically a documentary. I’ll see Vera Farmiga and Lili Taylor in just about anything, but I hope they pick better going forward. A good cast did what they could with the material, but when it devolved to absurd records of a woman called Bathsheba (Lesson the Second: If you want your daughter to be a good girl, there are certain names you oughtn’t stick her with) accused of consorting with Satan and centuries later she was the evil presence in the house in which, for some reason, we could see as well as hear clapping hands. For goodness’ sake. Just a note re witches: Everyone knows that women accused of being witches were not consorting with Satan; they merely had property or power that the local men wanted. Real witches were entirely different: Read Roald Dahl’s The Witches. He explains it all. 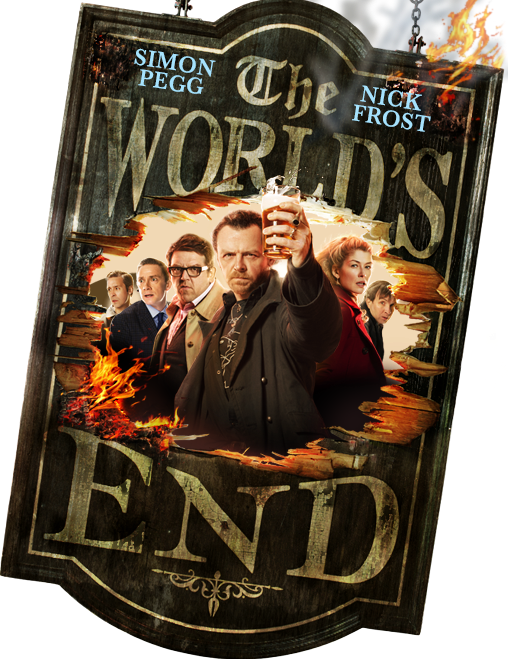 Now for the good movie of August: The World’s End, which is the name of a pub. A good start. Director Edgar Wright introduces us to 1990 Newton Haven, a cozy-looking small town somewhere in England, then passes by a little real life that’s not fun at all, and brings us back to Newton Haven 20 years later. 1990 is amusingly narrated and yet what we see rather conflicts with what the narrator recalls. Five friends somehow graduated from school and went on a pub crawl called “The Golden Mile” in their home town — yes, Newton Haven — which includes 12 delightfully named pubs at which the boys had intended to have one pint each. That’s twelve pints per boy. As anyone might imagine, it didn’t work out. Twenty years later, a sadder but no wiser Gary King (the scathingly brilliant Simon Pegg) wants to get the band back together, as ’twere, and do the Golden Mile. Life didn’t go so awfully well after high school (or whatever they call it in England), and Gary thinks re-living this epic night with his old pals will save him. His pals (whom he hasn't seen in many years) disagree, but go along because he lies to them. This is Simon Pegg and Nick Frost at their hilarious best, having a fine time with Paddy Considine, Eddie Marsan and Martin Freeman as all five pals grown up. The touristy map that could pass for a hotel placemat shows the route through town to the 12 pubs, and Gary marks off each one as they achieve it. The present attempt is as doomed as the first, but not for the same reasons as the 1990 crawl. 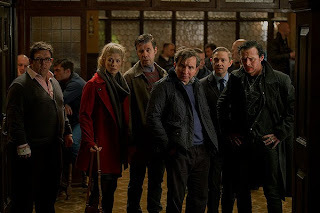 Martin Freeman, Paddy Considine, Simon Pegg, Nick Frost, and Eddie Marsan in a pub. 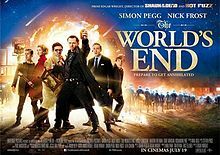 The brisk script by Pegg and Edgar Wright (co-writers of Shaun of the Dead and Hot Fuzz) builds and grows under Wright’s whimsical direction. The humans are all totally real, dreaming of a barely recognizable past that did not prepare them for adult life they don’t really know how to live, with Gary in particular compounding his unhappiness with foolhardy dreams of reliving past glories. Bruce Springsteen sang about it, and Pegg & Wright have written a sweet, thoughtful, and incredibly funny film about it all. And then there’s the darkness. The men gradually realize that not only have they changed, so has their home town. Rediscovery of all this is a jolly journey for us, not so much for the guys. In lesser, duller hands this would just be about 5 merely chronologically adult males behaving foolishly and getting gutter laughs. Pegg & Wright go much further, touching on dreams of freedom, lost youth...and then they take a roundabout turn into crazy. Frost, Rosamund Pike, Considine, Marsan, Freeman, and Pegg. In a pub. The World’s End has two lessons: 1) you cannot go home again, and 2) if your high school memories are warm and fuzzy, you’re probably misremembering. 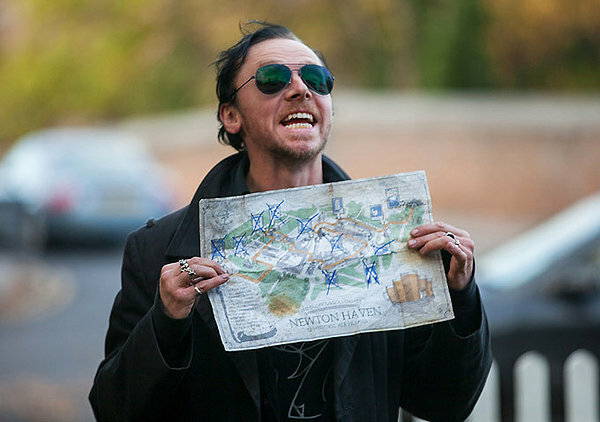 The World’s End has a terrific script well directed by Edgar Wright, and its cast is top notch and pitch perfect. I will see this again and again and find more to laugh about. Because humans are funny. ~ Molly Matera, signing off and purchasing another ticket!